SEARCH PROPERTIES ON THE GO! Dynamic map Add a pinpoint or draw a perimeter to see nearby homes for sale, open houses, or rental properties. Custom Searches Add search filters like price, neighborhood, number of beds, open houses, and more. Get Local See what schools and other points of interest are nearby. Full screen photo gallery Scroll through vivid, full-screen photos of homes. Anytime Access Save searches and listings, including notes or added property photos, across all your devices. Find an agent Not already working with an agent? 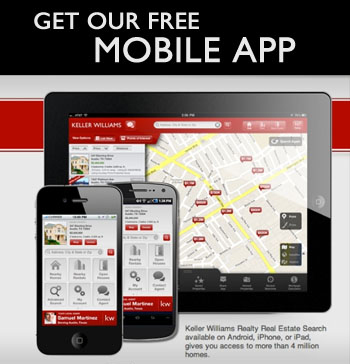 Find a KW agent and send property inquiries instantly. Share information Easily share homes through text, email, Facebook, or Twitter. Be calculated Free mortgage calculator to estimate home loan and monthly payments.